Ola Wilk/Wilk Marketing Communications photo Stalco Construction has completed the renovation of H.O. Penn’ parts, service, and retail departments at 660 Union Ave. in Holtsville, N.Y.
H.O. 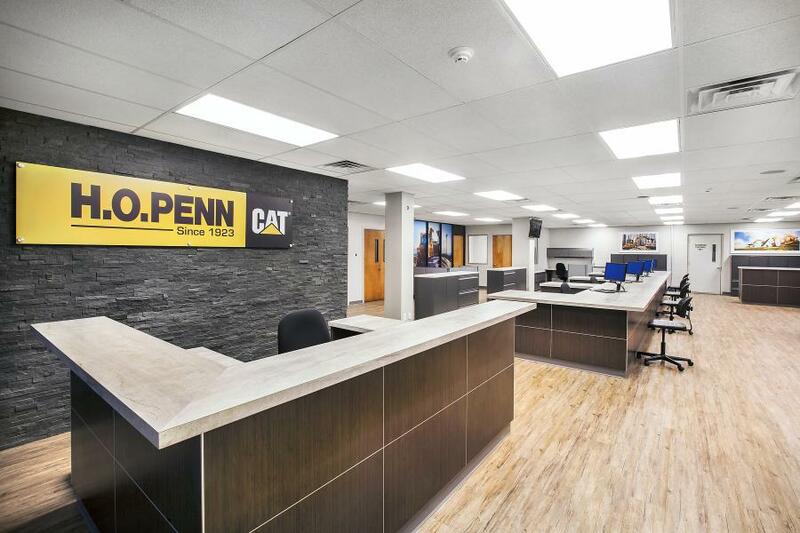 Penn, a 93-year old construction and industrial machinery sales and rental company, has completed the expansion and renovation of its parts and service departments as well as retail area. 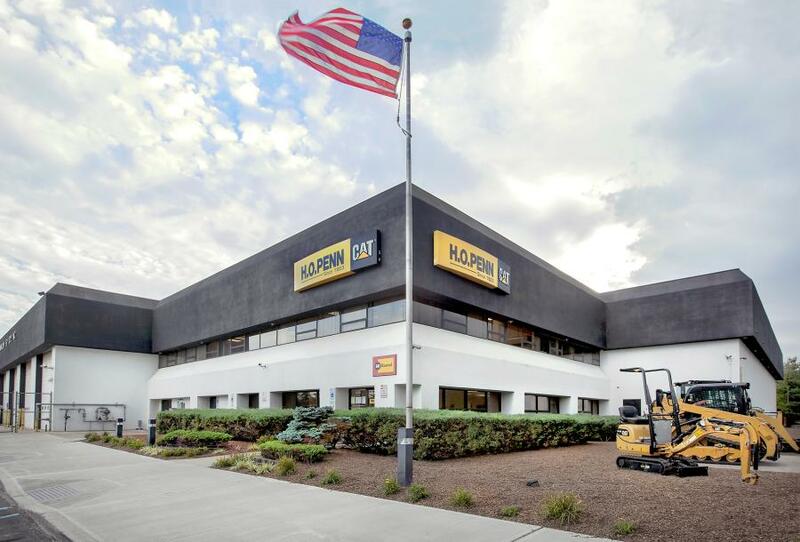 The 5,000-sq.-ft. renovated space is located on the first floor of the company's 42,000-sq.-ft., two-story building at 660 Union Ave. in Holtsville, N.Y. Stalco Construction served as construction manager and Rosebery Architectural Studio was the architect for the project. Established in 1923, H.O. Penn is one of the oldest Caterpillar dealers in the nation. The firm also sells, rents and services Metso crushers and screeners, and Crane Carrier trucks. H.O. Penn operates six full-service facilities, including two located in Holtsville, N.Y., on Long Island; the Bronx, N.Y.; Bloomingburg, N.Y., and Poughkeepsie, N.Y., in the Lower Hudson Valley; and Newington, Conn. Its staff totals more than 400 employees. “The renovation has significantly improved the quality of our customers' experience and allowed us to upgrade the point of sale area. Equally important, the renovation improved the work environment for our personnel,” said H.O. Penn General Parts Manager Liza Katz. “Stalco accelerated the project's construction schedule to limit disruptions to H.O. Penn's operations. For example, the service department was completely renovated during one weekend,” aexplained Stalco Principal Kevin G. Harney. In addition to Stalco, the project team included architect Rosebery Architectural Studio; interior design and branding consultant The Maude Group; electrical contractor 2 Gang Electric; and KK Signs. Following the renovation, visitors enter the retail and parts departments through the company's main reception lobby, which received a new reception desk, finishes and a stone feature wall. The new retail section is highly visible. It displays branded Caterpillar accessories, parts and toys. The stone tile wall, 9 ft. high by12 ft. wide, is installed behind the reception desk and serves as a background for a prominently displayed company logo. MSI International supplied the split face tile ledger panel of charcoal grey quartzite tiles in Coal Canyon color. 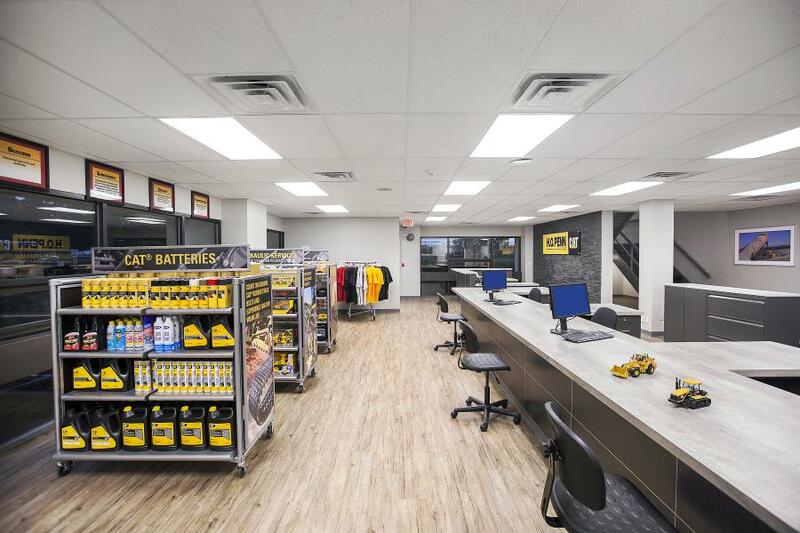 The scope of work in the parts department included the demolition of the preexisting offices and retail area, and the installation of a new storefront-type entrance, retail section, customer support counter, and a new office for the department manager. The renovated sales floor houses seven desks for sales staff and a private manager's office. The finishes include textured vinyl floors in the parts and service departments and carpet tile flooring in the manager's office. The rolled out Select Step G0007 vinyl floor in Barnwood Chestnut color and pattern imitating wood was manufactured by Mohawk Flooring. Philadelphia Mainstreet Carpet supplied the carpet flooring. The Armstrong Cirrus Ceilings, model 565, form a suspended acoustical tile ceiling, and the walls are made of gypsum board and Concrete Masonry Unit (CMU), painted in Benjamin Moore warm light grey. “The construction team had to address several logistical challenges. For example, the service department, in charge of shipments, is crucial to the operations of the company. The service office could not be shut down during the regular operation hours. To accommodate H.O. Penn, Stalco performed demolition on Friday evening and completed the renovation and finishes of the entire service department on Saturday and Sunday. The department resumed its operations on Monday morning without any interruptions,” said Jason Vasquez, Stalco's project manager. In addition to Stalco and Rosebery, the project team included interior design and branding consultant The Maude Group, electrical contractor 2 Gang Electric and KK Signs. Headquartered in Islandia, N.Y., with a regional office in New York City, Stalco Construction Inc. is a full-service general contracting and construction management firm active in the Greater New York area and on Long Island. Building Design & Construction magazine recently ranked Stalco as the 101st largest general contractor in the United States. Established in 1992, the firm builds commercial and institutional facilities for office, retail, educational, healthcare, governmental, entertainment, and worship clients. Stalco's personnel include professional engineers, architects, project managers, superintendents, and support staff. The value of the firm's on-going ground-up, interior, and capital improvement projects totals approximately $100 million. Stalco's current and recent work includes the $8.4-million Asphalt Green Battery Park City recreational center and the $15-million restoration of the landmark Pier A in Manhattan; the $24-million renovation of the Vaughn College of Aeronautics and Technology in Queens, N.Y.; the $24-million Emergency Department at the Lincoln Medical and Mental Health Center in the Bronx; the $1.4-million Home Fair store at the Atlas Park Mall in Queens N.Y.; the Ultra Diamonds and Liebeskind Berlin stores in Riverhead, N.Y.; two Lush Fresh Handmade Cosmetics stores in Manhattan; and the on-call construction management contract for the 780,000-sq. ft. One CA Plaza office complex in Islandia, N.Y.